There has been a wealth of recent research that has demonstrated that dementia patients greatly benefit from participating in art therapy. This is particularly so when a loved one is struggling with speech and processing language. Art therapy has proven effective in helping people with dementia better communicate through non-verbal means. Click To Tweet It has also been found that art therapy plays a large role in helping your loved one feel both calm, as well as mentally stimulated. Painting is a wonderful art therapy technique. If the weather is nice, take them outside for some nature painting. Research shows that just interacting and being in nature can help lower stress levels, so painting in your outdoor space can be especially soothing. Or, grab some old photos and let your loved one do some reminiscence painting. They can paint something from their past and help hold on to old memories. Creative coloring for adults has really grown in popularity over the past couple years and it is no wonder with all the benefits it has in calming and de-stressing those who try it. Buy a coloring book and some crayons or colored pencils and keep it where your loved one can see so they can color any time they would like! Music is powerful and has been shown to reduce agitation and improve behavioral issues in Alzheimer patients–even into the late stages. Music is the perfect way for them to connect, and can boost the spirit and even evoke happy memories. Dance and movement therapy is wonderful for those suffering dementia. According to the American Dance Therapy Association, dance and movement can help your loved one communicate through nonverbal behaviors, builds emotional closeness, improves motor skills, helps the individual calm down, and also build self-esteem. Grab some clay and let your aging loved one sculpt away. Sculptural art has been found to boost your overall feelings of wellbeing, relieves tension, and has also been found to boost their cognitive health and self-confidence. All arts and craft projects can give your loved one a sense of pleasure and accomplishment, as well as letting them non-verbally express themselves to others. When choosing an art project, make sure to avoid activities that are demeaning or too childlike. Help them start their craft and be there to assist them if needed. Also, make sure only safe, non-toxic materials are used and allow your loved one as much time as they need on their artwork. Art therapy is a growing field because of its many benefits for those with different forms of dementia. In fact, art therapy can actually help reduce the risk of developing mild cognitive impairment, which can lead to dementia. Above all, arts and crafts can create a bridge between residents and their loved ones, offering pathways for communication and reminiscence. 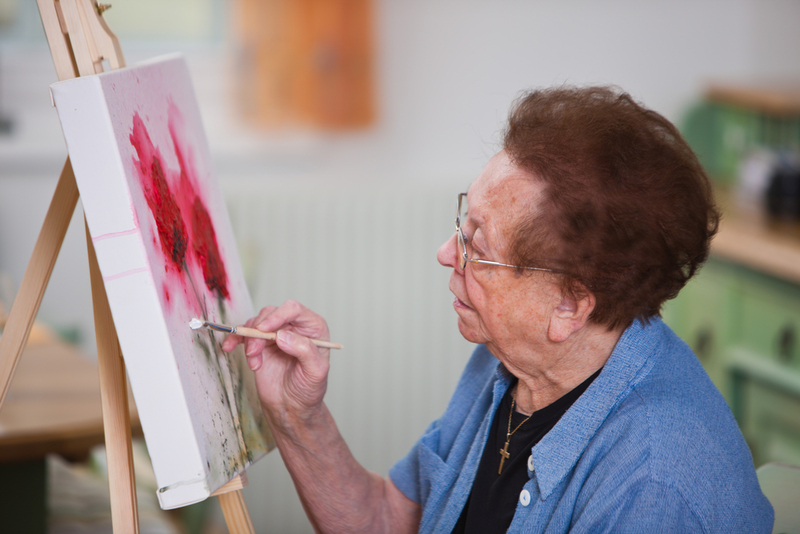 Contact us to learn more about art therapy techniques for dementia patients, or to find out what kind of activities we provide our residents.